Rajasthan BJP chief Ashok Parnami, in a press conference, acknowledged defeat as he said that his party respect's people's mandate. "We will work harder and form government in 2019,” he said. ​In a formidable showing, West Bengal's ruling Trinamool Congress wrested the Noapara Assembly seat from the Congress on Thursday and was all set to retain the Uluberia Lok Sabha seat with a huge margin even as the BJP emerged its main challenger. The counting was taken up on Thursday of votes cast on 29 January during the bypolls for both the seats. After a severe defeat in 2014, Congress party is set to sweep by-polls for three parliamentary seats in Rajasthan. The party has already bagged the Mandalgarh assembly seat and is leading in the Ajmer and Alwar parliamentary seats, all held by the ruling BJP. Rajasthan Pradesh Congress Committee chief Sachin Pilot, said Congress' victory is against the arrogance of BJP. Chief minister Vasudhara Raje should resigns taking the moral responsibility of defeat, said Pilot. Congress candidate Raghu Sharma has 34,6416 after a voter count of 54.47 percent. BJP's Ramswaroop Lamba has 2,75,782. Congress leads with 70,634 votes. After a vote count of 73.37 percent, Karan Singh of Indian National Congress has 4,60,088 votes. BJP's Jaswant Singh Yadav has 3,36,581 votes. Congress is leading with 1,23,507 votes. 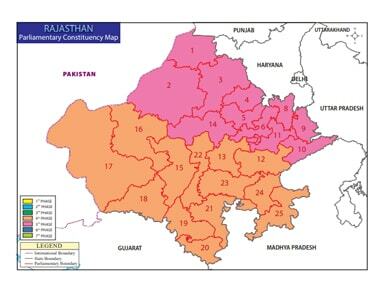 This round of by-elections covered 17 Assembly constituencies in Rajasthan. The BJP trailed in all of them, indicating which way the wind is blowing. The biggest worry for the BJP would be that it suffered heavy losses in Ajmer, it's bastion. It trailed not just in rural areas but also in urban centres areas of Ajmer and Alwar. The BJP tried everything in the election. It's large contingent of ministers and local heavyweights camped in the three constituencies. Nothing worked for the party. Congress's Vivek Dhakar wins the assembly seat by 11,136 votes. 17 Out of 21 rounds of vote count is done in Mandalgarh Assembly seat of Rajasthan. According to trends, Congress' Vivek Dhakar is leading in this Rajasthan seat by 3,282 votes. After 43.68 percent vote count, Congress is leading by 59,935 votes. Congress candidate Karan Singh Yadav is leading with 2,66,814 votes, BJP's Jaswant Singh is second with 2,06,879. Alwar Lok Sabha constituency in Rajasthan saw a turnout of 61.86 percent. After 24.84 percent vote count, Congress candidate Raghu Sharma is leading with 1,54,336 votes in Ajmer Lok Sabha seat. Ramswaroop Lamba who is the BJP nominee has 1,28,291 votes. Congress is ahead with 26,045 votes. Trinamool candidate Sajda Ahmed widens her lead over BJP candidate Anupam Mallick by 1,84,949 votes in Uluberia Lok Sabha seat. Both Uluberia and Noapara witnessed a quadrangular contest with BJP emerging as the prime challenger to the TMC. With nearly 40 percent minority community vote share, Uluberia has elected Muslim leaders for the past four decades. Over 76 percent of the electorate in West Bengal’s Uluberia Lok Sabha constituency. Congress leaders have accused the Opposition of swapping EVM machines of the Bulbani polling station came at the Pushkar assembly constituency. Congress is leading by 48,288. Karan Singh of Congress: 2,26,592 votes and Jaswant Yadav of BJP garnered 1,78,304 votes. Nota - 6173. Congress leads by 24,256. Ragu Sharma of INC 1,44,992; BJP's Ram Swaroop Lamba: 1,20,736 and Nota- 2,187. Congress leading by 2,012 votes: Congress candidate Vivek Dhakad is leading with 45,011, BJPs' Shakti Singh gets 42,999.
Who is to be blamed for the loss? Is this a vote against the Raje government? Is the verdict again the central government? Over the next few days, expect a lot of noise from within the BJP against Vasundhara Raje and her leadership. She would have to employ all her skills to ensure her survival after this debacle. The BJP is unlikely to take the loss without serious introspection. The 25 Lok Sabha seats in Rajasthan are extremely important for the party to be left for the Congress to increase it's tally in 2019. No good news for BJP from Rajasthan. The saffron party is likely to lose all three seats of Alwar, Ajmer and Mandalgarh where counting for by-elections polls are underway. These three constituencies have nearly 40 lakh voters. They are spread across three geographical regions of the state. The verdict is clear: The voter is not happy with the BJP. Trinamool is currently leading by 1,22,997 votes over its nearest BJP rival. Both Uluberia and Noapara witnessed a quadrangular contest with BJP emerging as the prime challenger to the TMC. With nearly 40 percent minority community vote share, Uluberia has elected Muslim leaders for the past four decades. Over 76 percent of the electorate in West Bengal’s Uluberia Lok Sabha constituency. To retain the Uluberia parliamentary seat, TMC fielded Sultan Ahmed’s widow, Sajda. The CPI(M)-led Left Front nominated Sabiruddin Molla, the Congress fielded S K Madassar Hossain Warsi and the BJP, its district committee leader, Anupam Mallik. Five independent candidates are also in the fray for the Lok Sabha seat. News18 reports celebrations at Alwar Lok Sabha constituency as Congress candidate Karan Singh continues to lead in Alwar with 40,000 votes. Congress: 108161, BJP: 85510. Congress lead by 22651 votes. Congress: 172535, BJP: 133289. Congress leads by 39,246 votes. Congress's Vivek Bhakad is leading in this Rajasthan seat with 1800 votes. After the tenth round there was a close fight between BJP's Shakti Singh Hada with 32,216 votes and Congress's Vivek Bhakad, reports News18. The Congress is ahead of the BJP by 39,246 votes as its candidate Karan Singh Yadav has 1,72,535 votes while BJP's Jaswant Singh Yadav has polled 1,33,289 votes. Congress' Vivek Bhakad is leading in Rajasthan's Mandalgarh seat, reports News18. After the tenth round, it was a close fight between BJP's Shakti Singh Hada and Bhakad, but Congress holds the lead for now. News18 reports numbers for Ajmer: Congress candidate Raghu Sharma ahead by 13002 votes. Total vote: Congress - 68585, BJP - 55583. Kishangarh - Congress ahead with 1023 votes. Pushkar - Congress ahead with 1488 votes. Ajmer North - Congress ahead of 2916 votes. Ajmer South - Congress ahead of 2601 votes. Massouda - Congress ahead of 1567 votes. Kekeri - Congress ahead with 3911 votes. Dudu - Congress ahead with 1103 votes. Nasirabad - BJP ahead with 1904 votes. Sunil Singh of Trinamool Congress has 77,983 votes, reported News18. BJP's Sandeep Banerjee is in second position with 30,220 votes. CPM's Gargi Chatterjee has 28,732 votes. The main contest is between the ruling TMC and BJP. Trends coming in from Rajasthan indicate Congress is on the revival path. For a state that goes to polls this year and in an year which precedes the seeking of a return mandate at the Centre, the finance minister will be mindful that the budget provides the ruling party with the last chance to make policy interventions and resuscitate ​the economy. Towards that end, there will be a lot of pressure on him to turn the budgetary exercise into an election manifesto to put out the fires that are raging in different corners. It is now certain that there there will be a slippage in fiscal deficit target. The deficit may touch 3.5% of the GDP and that could still be manageable for Arun Jaitley. His chief worry will be to mitigate the rising oil prices that have appreciated 35% in the last three months, deliver pro-poor measures and yet ensure macroeconomic stability. The finance minister has to somehow pull off a Houdini act. In Ajmer, Congress candidate Raghu Sharma is leading in all the assembly segments over his BJP rival Ramswaroop Lamba. Ajmer is one of the biggest cities in Rajasthan. It has a large population of government servants. That the BJP is trailing even in the urban areas with a large proportion of government servants is bad news for the party. It demolishes the myth of its invincibility in urban areas. Over 75.3 percent in the Noapara Assembly seat voted in bypolls. The bypolls to Uluberia Lok Sabha and Noapara Assembly seats were held on 29 January. Over 76 percent of the electorate in West Bengal’s Uluberia Lok Sabha constituency and 75.3 percent in the Noapara Assembly seat voted in bypolls. The main contest is between the ruling Trinamool Congress (TMC) and Bhartiya Janata Party (BJP), which is trying hard to emerge as principle opposition in Mamata Banerjee’s West Bengal. The Vasundhara Raje government has already completed four years in office and these bypolls are being seen as an indicator of the public mood ahead of the state polls. As many as 1,987 polling booths were set up for the Alwar Lok Sabha bypoll where 18.27 lakh voters are registered while for the 18.42 lakh voters in Ajmer, a total of 1,925 polling booths were set up. In Bhilwara districts Mangalgarh Assembly constituency, there were 2.31 lakh voters and 282 polling booths were set up. Ajmer and Alwar Lok Sabha constituencies saw a turnout of 65.2 and 61.86 percent while the Mandalgarh Assembly seat registered an even higher 78.78 percent as voting in the bypolls for these seats took place omn Janurary 29. In the first round of Noapara Assembly election counting — TMC got 7329 votes, Left front candidate Gargi Chatterjee in second place with 2290 votes and BJP candidate is in third place with 2286 votes. Whereas, Goutam Bose of Congress got 1503 votes and 234 votes in NOTA. Both Uluberia and Noapara witnessed a quadrangular contest with BJP emerging as the prime challenger to the TMC. Congress candidate Raghu Sharma is leading with 4500 votes in Ajmer. Former union minister Sanwar Lal Jats son Ramswaroop Lamba is the saffron party nominee from Ajmer. Out of the three seats that went to polls, the most significant is Ajmer. This is where the Congress and the BJP have concentrated. Alwar, the other Lok Sabha constituency where elections were held, was left largely to the local leaders and candidate. But, in Ajmer, both the Congress and the BJP sent their top leaders to camp and campaign. When the battle began, both the parties seemed evenly matched with dedicated vote banks. However, the controversy over the release of Sanjay Leela Bhansali's Padmaavat has annoyed a section of Rajputs, who traditionally vote for the BJP. Their vote may now be decisive in Ajmer. In every by-poll in Rajasthan for Lok Sabha since the 80s, the party that had won in the previous election managed to retain the seat. So, in case the BJP loses Ajmer and Alwar, it would be the first time when an incumbent would be ousted in a Lok Sabha by-election in Rajasthan. If the Congress fails to win, it would just be a repeat of history. A good indicator of the trend is the local satta market. The bookies of Rajasthan generally get it right. So, what are they predicting this time? The news from the bookies is not good for the BJP. They are predicting a big victory for the Congress in Alwar and Ajmer Lok Sabha constituencies. In Alwar the margin is expected to cross a lakh votes. In Mandalgarh, an assembly constituency in southeastern Rajasthan, the Congress is the favourite among punters. But, this is the only seat where bookies expect a tough fight. 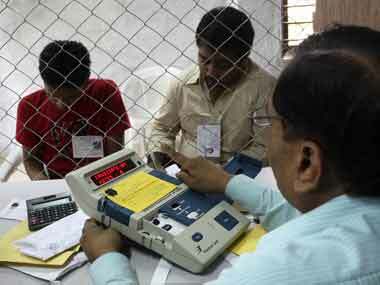 The by-election results of Uluberia Lok Sabha and Noapara Assembly seats, where counting starts at 7 am, will be a litmus test for the BJP, which is desperately eyeing fresh pastures in the state in the upcoming rural polls as much as they have been prestige fights for the ruling TMC. The death of two-time TMC MP Sultan Ahmed had left the Uluberia parliamentary seat in Howrah vacant, while the death of Congress MLA Madhusudan Ghose necessitated the Noapara Assembly by-poll in North 24 Parganas district. Counting of votes will start shortly today. There were 39,02,168 voters in Ajmer, Alwar and Mandalgarh constituencies. The Vasundhara Raje government in Rajasthan has already completed four years in office and these bypolls are being seen as an indicator of the public mood ahead of the state polls. Ajmer and Alwar registered 68.65 per cent and 65.50 per cent voting in the 2014 general elections while Mandalgarh had recorded 82 per cent voting during the 2013 Rajasthan Assembly polls. Ajmer and Alwar Lok Sabha constituencies saw a turnout of 65.2 and 61.86 percent while the Mandalgarh Assembly seat registered an even higher 78.78 percent as voting in the bypolls for these seats took place on Janurary 29. Despite the healthy turnout, the figures were still less than those recorded the last time these constituencies went to polls, officials said. In the budget there is step motherly treatment with people of Delhi and other non BJP States. If this is called a visionary budget then god save the nation. By the way there is already a referendum against Modi government in today's bypoll results! BJP has got 0 out of 5 seats. According to News18, TMC is leading by 2,08,180 votes. Uluberia has elected Muslim leaders for the last 40 years and has nearly 40 percent minority community vote share. After the first round of counting, Trinamool is leading by 9000 votes, reportedNews18. Both Uluberia and Noapara witnessed a quadrangular contest with BJP emerging as the prime challenger to the TMC. To retain the seat, TMC fielded Sultan Ahmed’s widow, Sajda. The CPM-led Left Front nominated Sabiruddin Molla, the Congress fielded SK Madassar Hossain Warsi and the BJP, its district committee leader, Anupam Mallik. #RajasthanByPolls -- Alwar by poll Result: BJP candidate Jaswant Singh Yadav ahead in the third round, leading with 3878 votes. Congress candidate from Alwar constituency is Karan Singh Yadav, gets 3588 votes. 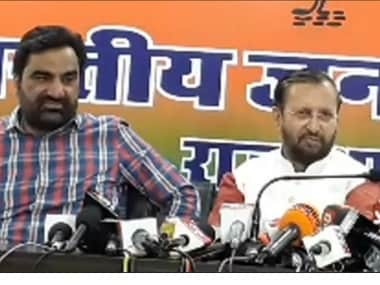 1 Feb, 2018 | 3.57 pm: Rajasthan BJP chief Ashok Parnami, in a press conference, acknowledged defeat as he said that his party respect's people's mandate. "We will work harder and form government in 2019,” he said. 1 Feb, 2018 | 3.42 pm: Congerss has converted its lead in Alwar into a win. The party defeated BJP with a margin of 1,56,319 votes. TMC won in West Bengal's Uluberia by a margin of 4,74,023 votes. 1 Feb, 2018 | 3.20 pm: As the election trends are becoming clearer, the news point of the day is that the BJP is looking at a defeat in all five seats across the two states. Congress has bagged three Rajasthan seats previously held by BJP while TMC is set to win two seats in West Bengal. 1 Feb, 2018 | 2.19 pm: In Ajmer, Congress candidate Raghu Sharma has 34,6416 after a voter count of 54.47 percent. BJP's Ramswaroop Lamba has 2,75,782. Congress leads with 70,634 votes. 1 Feb, 2018| 1.14 pm: Congress's Vivek Dhakar wins Mangalgarh seat by 11,136 votes. 1 Feb, 2018| 12.57 pm: After 43.68 percent vote count, Congress is leading by 59,935 votes. Congress candidate Karan Singh Yadav is leading with 2,66,814 votes, BJP's Jaswant Singh is second with 2,06,879. 1 Feb, 2018 | 12.38 pm: After 24.84 percent vote count, Congress candidate Raghu Sharma is leading with 1,54,336 votes in Ajmer Lok Sabha seat. Ramswaroop Lamba who is the BJP nominee has 1,28,291 votes. Congress is ahead with 26,045 votes. 1 February, 2018 | 12.24 pm: Fireworks have already started outside Rajasthan Pradesh Congress Committee office, News18 reports. Party workers are oragnising a grand welcome for PCC President, Sachin Pilot. Pilot will address a press conference at 12:30 today. Going by the initial trends, Congress is leading in the two Parliamentary seats of Ajmer and Alwar and also the Mandalgarh Assembly seat in Rajasthan. This is turning out to be a massive blow for the Vasundhara Raje-led BJP government in Rajasthan that is headed for Assembly elections in a few months. Meanwhile in Bengal, the Trinamool Congress surged ahead of its rivals in both the Noapara assembly seat and Uluberia Parliamentary seat and has now won Noapara by a huge margin. Former Rajasthan Ashok Gehlot said, "This bypoll is a vote against BJP's divisive politics. Apart from changing names of Congress-era schemes, Vasundhara Raje government hasn't done anything the past 4 years. Unemployment is hurting the youth. 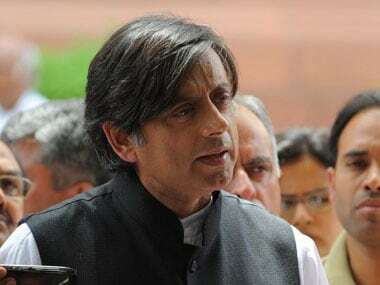 Today's trends can be seen as precursor to not just state Assembly polls later this year but also next Lok Sabha polls." It is a popularity test for chief minister Vasundhara Raje this bypolls. The BJP has been in power in the state since 2013 and in the 2014 Lok Sabha election had won all 25 seats. The Congress, led by state chief Sachin Pilot, campaigned aggressively for the bye-elections. It's a prestige battle for Pilot, who was the Ajmer member of Parliament before he lost the seat to the BJP as a Modi wave swept the state. As Congress gained a massive lead in Ajmer and Alwar districts of the state, Pilot said, "Initial trends from Rajasthan are a mandate against the government, I hope our leads will increase even more. Vasundhara ji and her government have been totally rejected by people." In Bengal, the fight for both the Lok Sabha and Assembly seat is expected to be a straight contest between the ruling Trinamool Congress and BJP, which has been struggling to find a foothold in Mamata’s bastion. In Rajasthan, the bypolls are not only a test for Chief Minister Raje, but also for Rajasthan Congress chief Sachin Pilot, who has been campaigning aggressively in Alwar and Ajmer. It is being termed as a ‘semi-final’ ahead of the all-crucial Rajasthan Assembly polls scheduled for the second half of 2018. These seats went to polls on January 29 and counting is expected to start shortly. The counting of votes of the Alwar and Ajmer Lok Sabha seats will be done in the respective constituencies, whereas it will take place in Bhilwara for the Mandalgarh Assembly seat, a spokesperson of the state election department said. A total of 42 candidates are in the fray for the bypolls to the three seats, the election to which was held on Monday. Voting in bypolls for Ajmer and Alwar Lok Sabha constituencies and Mandalgarh Assembly seat in Rajasthan was held on Monday, recording polling percentages of 65 percent, 62 percent and 80 percent respectively. In Alwar, Jaswant Singh Yadav of BJP and Karan Singh Yadav of the Congress have contested the election, while Raghu Sharma of the Congress and BJP's Ram Swaroop Lamba locked horns in Ajmer. In Mandalgarh, BJP's Shakti Singh Hada and Congress's Vivek Dhakad are poised for a tough fight. On Monday, a technical error in an Electronic Voting Machine in Kekadi village was reported, due to which voting was stopped for some time. In Keladi's Manda, villagers boycotted polling to protest inadequate water supply. They also rued that their village roads were in bad condition. Dense fog in Alwar resulted in a low turnout in the first hour after the beginning of polling, but voting picked up after 9.30 am. Voting percentage witnessed further increase afternoon in all three constituencies as voters in large numbers came out to votes. The bypolls on all the three seats were necessitated after the sudden death of BJP MPs Sanwarlal Jat from Ajmer, Mahant Chand Nath Yogi from Alwar, and MLA Kirti Kumari from Mandalgarh.